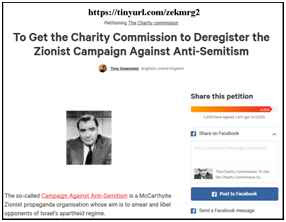 Ten months ago I submitted a complaint to the Charity Commission against the fake Zionist ‘charity’, the far-Right Campaign Against Anti-Semitism. Formed at the height of Operation Protective Edge in the summer of 2014, the CAA sees its mission to attack the supporters of Palestine and anti-Zionists as ‘anti-Semitic’. 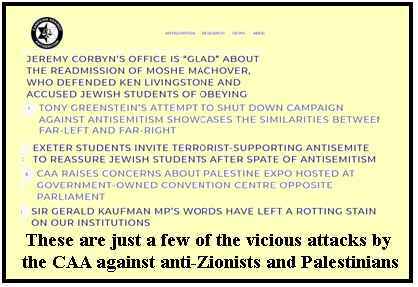 Just over a year ago, the CAA even filed a complaint against Jeremy Corbyn, accusing him of anti-Semitism! This far-Right 'charity' defames any and every opponent of Zionism. When Sir Gerald Kaufman, a Jewish MP died, they described him as having 'left a rotting stain on our institutions.' because he spoke out against Israel's mass murder in Gaza. The CAA is at the forefront of a new Zionist activism which resulted in an attempt by a group of Zionist fascists to stop the Balfour Day demonstration of Palestine Solidarity Campaign in London. The CAA applauded their actions. 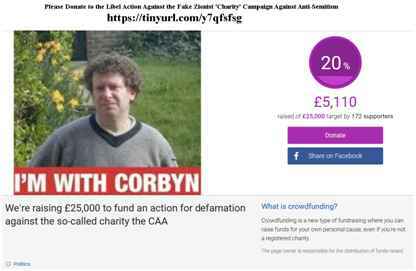 I have decided to bring a libel action against the CAA for its description of me as a ‘notorious anti-Semite’ but to do that I need to raise at least £25,000. I am pleased to announced that we have now raised over 20% of the total. This means that I am able to instruct a barrister to draw up papers to file at the High Court before the February 25th deadline. However this is only the first step. I am not suing the CAA on behalf of myself but on behalf of all those who have suffered from its libellous attacks. It's not just my fight but yours too. I am ready to face the prospect of being made bankrupt but I am also asking that you to make a sacrifice and donate as much as you can to the crowdfunding site. Please also share on social media.